Such a sad ending to a very difficult day! Late this morning we had a call from Happisburgh Coast Watch on the North Norfolk Coast. They were observing an adult male seal on the beach who they thought to be very poorly and they unexpectedly witnessed a fisherman throw something towards the seal. It must have given the seal quite a scare as he managed to summon up the energy to haul him self back into the water albeit very steadily. He was too weak to swim so he let the tide take him along towards Eccles. I rang some of our ‘Shore Watchers’ to see if he could be found and quickly. Stefan Ganther from Eccles located him and told us where to find him. The tide was almost in and we had a 20 to 30 minute window to get him assessed. I know that we couldn’t get there that quickly. A few phone calls later, to see who was where and David from Wild Touch diverted himself over to Eccles and arrived with minutes to spare. He called me back to say that the seal was too poorly to attempt a big team going out to try and rescue him and he needed to be put to sleep urgently. The tide, as expected, washed the poor soul back out to sea. Alison and I made tracks to Happisburgh to keep the dog walkers away from that direction. After some discussion Stefan knew that, due to the large sand bar in that location, the tide would gently put him back ashore just before the first reef at Sea Palling. I was talking to Bob from the RNLI when Stefan’s second call came to say he had managed to locate him again. Bob kindly helped us with directions as it really is a maze in and around Eccles. I had been in touch with RSPCA inspectors all afternoon and I knew that they wouldn’t be able to get to us before the light went. Daniel from Marine Wildlife Rescue, who holds a licence, agreed to come and put him to sleep. 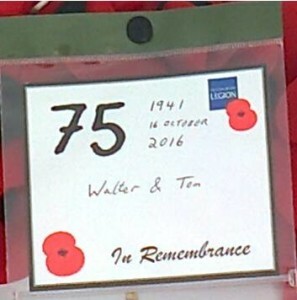 We had to have a police presence there, whilst the deed was being done, because it was a public place. It all came together very smoothly in the end. I hope that the fisherman hangs his head in shame for his thoughtless actions this morning. He certainly put that seal through a very unnecessary amount of stress and suffering. 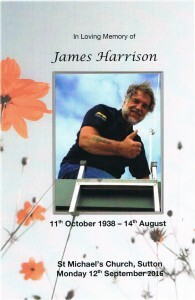 He could have been quietly put to sleep this morning when he was first seen. I truly can’t thank everyone enough for their support and amazing help today. I am also feeling very proud of my ‘shore watching’ team and I thank the Lord that Stefan found the poorly injured seal, not once, but twice. Alison and I are feeling a bit empty and drained now. However, we also feel very proud of the way that Marine Wildlife Rescue, Wild Touch along with two inspectors from the RSPCA helped us to pull all this together in such a short space of time. The formal Poppy Wreath bearing the 255 Squadron’s crest was accepted for placement in the Happisburgh Coast Watch Cabin that now over looks the crash scene that killed Sergeants Walter Barker and Tom Varley. On Tuesday 30th August 2016, our duty Watch Keeper was observing a large number of visitors on the beach and became concerned about a small inflatable dinghy which had been launched off the beach with one person on board. The time and location of the launch was logged, and the Watch person noted that he thought it too small to go out to sea. The inflatable was observed travelling offshore quite a distance off Sea Palling so regular checks were made of its progress and position using the HCW telescope. After a short while, the dinghy moved nearer to shore and seemed to be in safer, shallow, water. The Watch Keeper was also observing children climbing on groynes and was unable to monitor the dinghy continuously. However, on returning to the telescope he noticed that the dinghy had turned over and was moving out into deeper water. Unable to see the person on board, he immediately assessed the situation as potentially critical, and notified the Coastguard of what had happened, giving them details of the last known location of the dinghy at 15:37h. The HCW Watch Keeper continued to closely monitor the area using both telescope and binoculars to see if anyone could be seen in the water. The RNLI lifeboats were launched and the area searched for several hours. The dinghy was recovered, but no persons or casualties were found. Once again, this reinforces the need to have a constant, vigilant, observation post on the coast, which can alert HM Coastguard as soon as a potentially dangerous incident is spotted. Happisburgh CoastWatch has a team of around 25 volunteers giving up their time to keep the look-out at Cart Gap open from 9am-6pm April-September, and from 10am-5pm October-March. From their vantage point they can maintain Watch over 2 miles of coast line, from Happisburgh to Sea Palling, and out to sea, over the dangerous Haisbro Sands, for up to 10 miles. September 2015 at approximately 11.40 am, Happisburch Coast Watch alerted HMCG having witnessed a small fishing vessel at Cart Gap in difficulties. As soon as the boat was launched it was apparent that it was taking in water at the stern. The two men aboard were unable to bring the boat ashore and started waving for assistance. The men, although not in any immediate danger as the weather conditions and the sea state were calm, were not wearing any buoyancy aids. 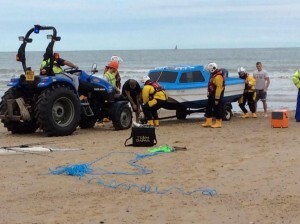 The RNLI and the Coast Guard attended the scene and once the boat was pumped out they were able to drag the boat up and the RNLI tractor towed it out of the water. John Golby has been volunteering as a Happisburgh Coast Watch member for 18 years this week. 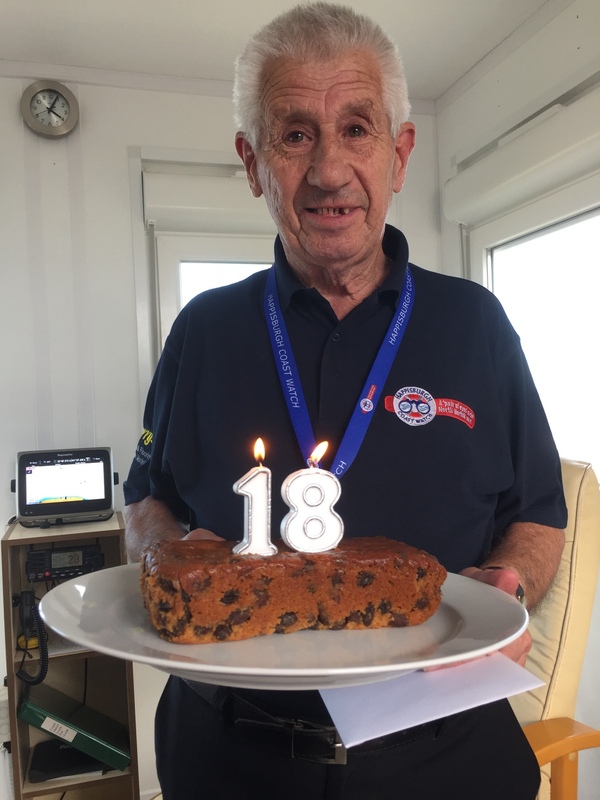 We celebrated by taking him a cake to celebrate and the EDP will run a story on John’s great achievement! I am sure you will all join me in congratulating John on this fabulous achievement. 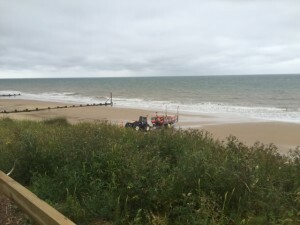 On Wednesday 8 July 2015, around 16:35, following some very high winds and heavy rain, John Brooks of Happisburgh Coast watch (HCW) spotted a small sailing vessel about 1nm off the reefs at Sea Palling, which was not making headway. HCW observed the vessel for 5 minutes during which time the sail boat appeared to be in difficulties. The boat was wallowing in the swell, and seemed unable to raise its mainsail due to what appeared to be tangled rigging. HCW called HMCG at approx 16:40 to advise them of the situation. 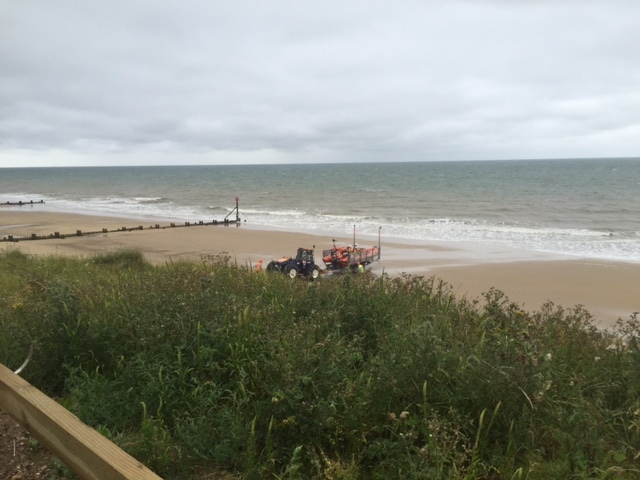 At 16:45, in reducing visibility, after observing that the sailing boat was drifting nearer the reef, and still not under way, and appearing to be out of control, HCW notified HMCG who then called on Happisburgh RNLI to assist. At approx 17:00 the lifeboat was launched. Meanwhile the vessel had drifted further round the reefs and was now out of sight of HCW. The lifeboat reached the vessel around 15 minutes later. The 25 foot sail boat, with one person on board, had been trying to anchor off the reef but had lost one of its anchors. The lifeboat assisted in finding a safer place to anchor. The rigging was also tangled and would have to be attended to before the boat could get underway. The sailor decided to anchor for the night, as the weather was continuing to deteriorate. 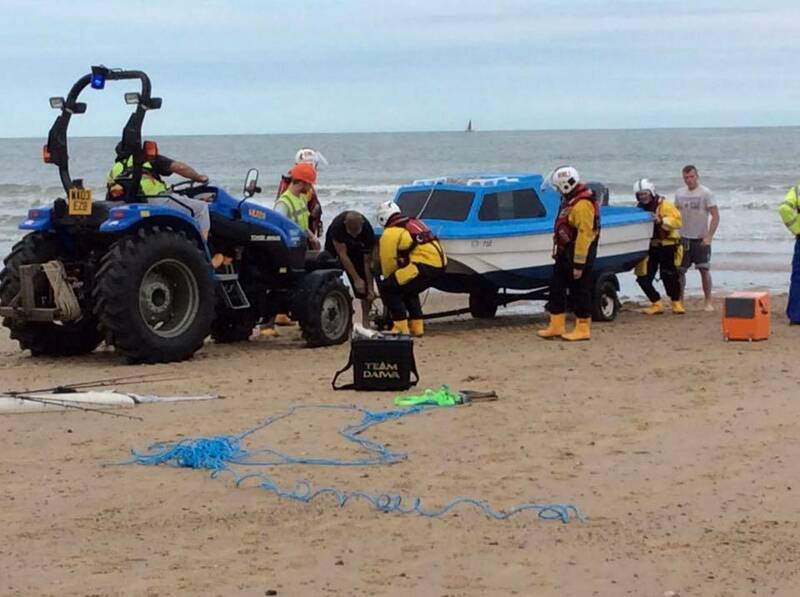 Last Friday 3rd July at 14.00hrs a small Topper sailing dinghy was also spotted in difficulties off the shore of Happisburgh beach. The vessel had managed to capsize and the sailor was having difficulty righting the boat. HCW observed the dinghy until it was safely ashore. HCW provides a surveillance and reporting service along part of the East Coast (between Walcott and Sea Palling), and out past the treacherous Haisboro’ Sands. This service works in close relationship with HM Coastguard, providing alerts and support to incidents that occur along the beach and out to sea. These can involve beach users, sailors, jet-skiers, fishermen, as well as larger commercial vessels. To join the team, please call Louise Brooks 07976 432019. 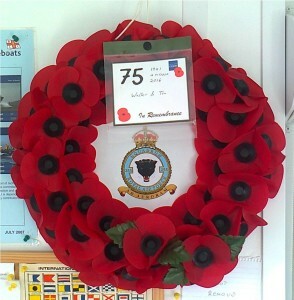 To donate by text, text HCWA24 £2 to 70070. Come and see our new lookout station and meet our volunteers. Also meet the Coast Guard and RNLI. Little seal update. Our pup is a girl and has been called Madame Pomfrey ( Harry Potter theme this year) and is doing very well and eating her fish at East Winch RSPCA wildlife hospital. Apparently seals can deteriorate v quickly, but it’s looking good so far. Happisburgh Coast Watch was involved in the rescue of a seal pup today Friday 10 April 2015. Initially reported by member of the public to Mike Stevens, we kept an eye on this little pup, notifying the RSPCA that we may need assistance. Roy Speed and Louise assessed the pup again at 2pm and felt that the pup was indeed quite unwell and had been injured by another seal or dog. The RSPCA were with us within 2 hours and Roy helped them load the little chap into its crate for its journey to the Sealife centre for some TLC. RSPCA were excellent.